Fatima: The 91st Anniversary… Mary or a UFO? Before I launch into this BLOG about Fatima, let me establish my intentions. I do not, in any way want to use this article to bash Catholics. That being said, I would like to point out that Fatima may be a precursor of what I believe is the coming great deception. Here’s a portion from my book, Politics, Prophecy & the Supernatural that gives an overview, of the events surrounding the so called, Fatima apparitions. The 91st anniversary is coming up on October 13th, so I’ll be Blogging on this for the next several days. In 1917 three children (who would later become known as seers), Lucia Santos and her two cousins Francesco and Jacinta Marto, were tending sheep when they beheld an apparition of, what it would later refer to itself as, “a lady from heaven.” The apparition told them to come to the same place—Cova da Iria (Irene’s Cove, a place located near the town of Fatima, Portugal)—on the thirteenth day of the following month. The children told their parents about what they had seen and this set off an uproar in the town. The apparitions continued for months, finally culminating in the local priest instructing the children to ask the apparition for a sign. They did as they were asked, and the apparition told them that the following month, which was October, there would be a sign, for all to see. The next month upwards of seventy thousand people gathered in the field at Cova da Iria. It had been raining all day, and there was a thick layer of clouds overshadowing the crowd. A cross section of humanity gathered that day: bankers, peasants, clergy, bakers, young, old, reporters, believers, and skeptics alike all waited for the sign that the apparition had promised would appear. The appointed time for the “sign” to manifest, which was noon, came and went, and nothing happened. The crowd grew restless. An hour passed and one of the “seers” called out, “It’s the Lady.” The crowd could not see her, but the children apparently did, and everyone waited to see what would happen next. The dark sky suddenly parted to reveal what many onlookers described as “the sun.” It spun around throwing off an array of colors and then, to the terror of everyone, began to fall in a pendulum like motion to earth. What followed was mass hysteria, as people thought the end of world was upon them. Some dropped to their knees, while others ran about screaming hysterically. (This event is now called, “the Miracle of the Sun.”) The “sun” then began to ascend to its rightful place in the heavens, and when it had departed, the crowd realized that their clothes, which had been soaked by the constant rain, were dry. Most everyone in the crowd that day had his or her worldview altered for all time—many choosing to believe in the apparition that called herself the Lady from Heaven. Imagine yourself standing in that field and experiencing what would later be hailed as, “The Miracle of the Sun.” Would you examine your belief system? If you were from another faith, perhaps Judaism, would this event cause you to wonder as to what you were seeing? If you were an atheist, would not seeing the “miracle of the sun” make you pause and consider that there may be an unseen world? And finally, if you were a Catholic, how would it affect you? Would you start going to church everyday or maybe join the priesthood or a convent? Before I continue, I must once again issue a caveat: the following critique of this event is not meant in any way to demean the Catholic Church or those who have a different opinion—specifically the belief that this apparition was the Mother of God or the biblical figure of Mary— than I do regarding the apparitions at Fatima. The purpose is rather to point out what I believe was a cosmic deception that fooled most everyone. Following is a section from my third book in the Nephilim Trilogy, The Revealing. It has a scene where an aged Nazi (called “the Hag”) tells a defrocked priest (Fitzpatrick, or hisnickname, “Fitz”) what really happened that day in Fatima. Afterward I will expound on why I wrote this fictional account and why I believe that what transpired at the Cova da Iria, in Fatima, is in fact a harbinger of deception—a precursor to events that will come upon the earth. The Grays: Part 2… Fear. Over the weekend I watched a repeat of ABC’s Seeing Is Believing. Once again I tip my hat to ABC as they treat the subject of UFOs seriously. The interviews with the witnesses are compelling, while the skeptics appear, from time to time trying to make their case that all of this is just mythos, that has been generated from decades of B movies, and Star Trek episodes. They provide no real answers of explaining what the phenomena is, and don’t measure up to the people who have actually had encounters. Bottom line is this. When you see one of these UFOs or Grays, everything changes as you try to fit it into your world view. On the show, one of the witnesses had been abducted and he spoke about it with lucidity. Unlike those who have to be hypnotized, in order to recall their abduction experience, this one particular man was laying, in his bed, wide awake when suddenly, at the foot of the bed, four ‘Gray’s appeared. They took him aboard their ship and he came face to face with what he describes as the most terrifying creature he had ever seen. He described it as some sort of insect like being. (This type has become known amongst ufologists as insectoids) You can see from the mans facial expressions and body language that even recalling the memory brings such an overwhelming fear into his life, that he’s not sure how to deal with it. I have said before that the currency of the kingdom of the Luciferians is fear. The Grays, in my opinion are ambassadors of that kingdom. They are the thralls, and do the dirty work, as they are the ones who appear in someone unfortunate souls room and carry out the abduction. A large part of what they do is to create a climate of fear. Everything is done in a deliberate way to create that fear. In part one, there was a poem by an abductee, Corina Sables. She has grown to hate the Grays. She fears them, and with good reason, as she is powerless to stop them from abducting her. In some twisted satanic way, the grays and their overlords are fed by this fear. In the ABC presentation they borrow footage from other shows, I think Taken was one of them, that showed the typical end result of the abduction, as a young man was being held down on a table while the Grays probed and conducted tests on him. He was wild eyed and struggled to free himself, as he screamed hysterically, and who wouldn’t? The Grays conduct this with great deliberation. This is what they want. I believe that they thrive in a climate of fear. At some point, when they reveal themselves it will be in a climate of fear. I have put forth the theory that this will come at the end of the Middle East war that is looming on the horizon. Think of the fear and uncertainty that it will create, if that war becomes a reality. What of the financial crises that we face and the housing market meltdown? What about Russia sending warships to Venezuela? And then there’s the October 14th ‘prophecy’ that says we will have a sighting of a huge UFO that will be seen by everyone for 72 hours. If this happens- and I’m betting it won’t – how will people react? The picture on the right is by Doug Chaffee. He’s been gracious enough to allow me to use it in this post. It is a picture of what has become known, as the Grays. They have become part of our culture. They are depicted as ‘friendly’ and somewhat needy as they hang out with the energizer bunny. In fact, the Grays are so fond of him that, that after they whisk away, in their ship, they return, moments later and beam the furry little rabbit up, into their ship, in what can only be described, as the classic abduction scenario. Then there’s the gray’s that dance and shake their collective alien booty, on the Internet, in hope of enticing you, to click the link and refinance your home. I wonder if one of them works at my local bank? Of course the History channel has run a special regarding the grays, and authors such as Dr. Jacob’s, who by the way we interviewed for our monthly newsletter, have written books, on what he believes is the sinister agenda, of the Grays. So what are they doing here? There are those who refuse to take seriously the sightings, by hundreds of witnesses that have had encounters with these creatures. Abductee’s describe them as void of emotion and focused on their task at hand. They kidnap unwary citizens from their sleep, float them through walls or glass windows and take them to their ship, where they perform medical examinations. Most of these are reproductive in nature. But what if someday they do show themselves. Take a look at the eyes that Mr. Chaffee drew. They are hypnotic. In my book PP&S I did an interview with Corina Sables, who has been abducted for decades, and so far, has been unable to stop them. She has written a poem about their eyes. 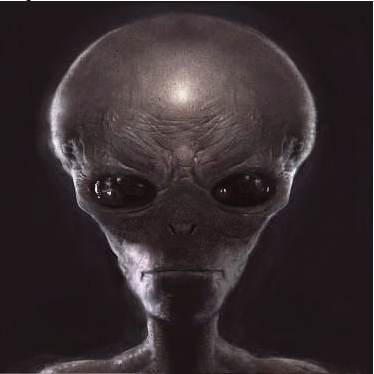 Chuck Missler and Mark Eastman wrote, in their book Alien Encounters, that if you encountered one of these beings, you were to avoid looking, in their eyes at all costs. In the Nephilim series, Art Mackenzie has an encounter and as he unable to look away, his mind explodes with images that he’d rather not have to deal with. Corina Sables poem says it all, and I post it here. It can be found in Politics, Prophecy & the Supernatural on page 151. 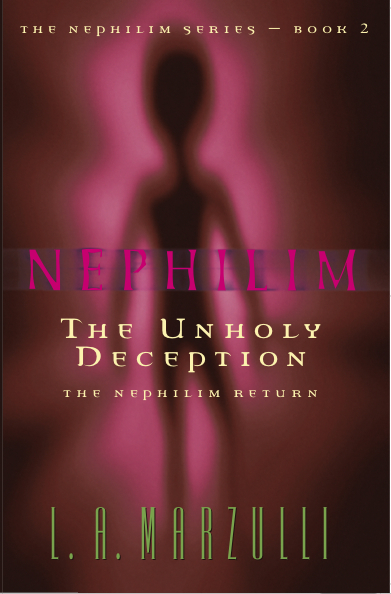 In 2002 I published the second book of the Nephilim Trilogy, The Unholy Deception. I coined the phrase, Great Deception, and used it in that book, for the first time. Since then it has been picked up by other authors and BLOG sites. It can be found on page 111. Here’s the set up. Art MacKenzie, the story’s hero, is asking his mentor and friend, Johanen about the Mystery of Iniquity, or lawlessness, end. “So when will this iniquity, as you call it, end? Or does it?” Mac asked. “And the evil will end?” Mac asked. So there it is. The concept of the coming Great Deception. I find it ironic that there are some sites where I’m not welcome – I won’t mention any names – but they’re using the phrase that I coined, as if they invented it. I’m not angry, just a little disapointed that my writings are not welcome. My Nephilim Trilogy owes a debt of gratitude to Dr. I. D. E. Thomas’ now classic work, The Omega Conspiracy. All of us who have ventured to put pen to paper, on this subject, have read and re-read this book. Why I may have coined the phrase, Great Deception, it was Dr. Thomas who linked the modern UFO phenomena with Genesis 6. My hat is off to you sir. You are indeed a trail blazer! We are at a juncture in history in which I believe reflects the warning of Jesus where he declares, it will be like the days of Noah, when the Son of Man returns. The UFO phenomena is not going away and there are many who believe that these so called extraterrestrials, are here to usher mankind into a new age of enlightenment. They have, in my opinion, embraced the Great Deception. This coming deception will be that the so called aliens were our progenitors, that they genetically manipulated us from primitive man and that they were responsible for the worlds religions. There are those who believe that ET created all of the miracles found in the Bible. What is coming will shake the world. What is about to befallus, is the Luciferian end game. It is one of deception, and it will, if possible, deceive even the elect. This is more bad news for the Middle East. Are the Syrians positioning troops for the coming war? Is Lebanon going to be over run by Syrian Commandos? Added to this mix is the recent announcement, by Russia that it is selling arms to Iran. Specifically the Tor-M1 Missile system, and as I have BLOGGED about the S300 surface-to-air missile system. Russia has also upped it’s ante, by sending warships into the region and supplying Syria with arms. So here’s the picture, as I see it. Israel is now surrounded by neighbors who are arming themselves to the teeth. The threats by Iran and their vitriolic president, I’m-in-a-jihad (Ahmedinejhad) don’t leave much room for diplomacy. At some point the ‘pot’ is going to boil over and when it does there will be an all out war in the region. Is this the coming war of Ezekiel, that I continually BLOG about? Is the prophecy of Isaiah 17, about to be fulfilled too? This states that Damascus will be destroyed. This has never happened and in fact, Damascus is the oldest, continuous, inhabited city, on earth. In a statement issued several months ago, Israel made it very clear that if Syria were to use chemical weapons against them, they would annihilate them. Strong language by the Israeli’s. The hatred toward Israel, is off the charts by Iran, Hezbollah, Hamas and Damascus. So how long before someone pulls the trigger? The war that is coming will be devastating. It will be far greater in devastation, than what happened at Hiroshima and Nagasaki and unlike the time period of WWII, the nations of the world will watch it unfold, in real time, as we are now linked together by Television. This month, in our newsletter, I’m interviewing Dr. Lynne Kitei. She has produced a documentary on what has become known as the Phoenix Lights. It will be interesting to have her come on the record and get an inside view of the phenomena, that startled the city, of Phoenix, over a decade ago. Some of those witnesses who saw the craft, up close, are interviewed in Dr. Kitei’s documentary. They describe the craft, as a huge, mothers-ship, that glided, without a sound, above them, blotting out the sky. Last week on the ABC special, Seeing is Believing, another witness from the Stephenville UFO flap, a pilot, said that the object that he saw was being chased by two F15,s. Other witnesses have stated that what they saw was huge. In my opinion, there won’t be any revealing, of a large Mother-ship, on that day. I have BLOGGED about this and you can read what I said about it for yourself. However, let’s run a hypothetical. What if it does happen? What if we awaken on October 14th and we see a large Mother-ship hovering over one of our cities? How will this affect you and I? How will such an event change and reshape our world view? When I interviewed Ricky Sorrel, he was still trying to deal with what he had seen. He was thinking about it and trying to come to terms with it. The purpose of my books, BLOG, and radio appearances, is to warn of the coming great deception. This deception, as I have posted throughout this BLOG, is the concept that E.T. were our progenitors. That it was they who genetically manipulated us from primitive man, thousands of years ago. It was the extraterrestrial that started all the worlds religions and now, that we have reached a climax, in our ‘evolution,’ they have returned to help us through this difficult time, of transition. This, in short, is the Alien Gospel, and it is a lie of the highest magnitude. When this revealing happens – probably not on October 14th, but at some time in the near future – people will have to deal with it, and like Ricky Sorrel, many will struggle to come to grips with what they are seeing. This event will be a Mega-lever, in that it will cause a paradigm shift, as everyone on the planet will have to adjust their belief system. I ran into an old friend today on my early morning three mile run. He was on his bike and we waved and grunted out the obligatory, “good morning.” I finished my run and was huffing and puffing, pleased that my 58 year old body was dripping with sweat from my efforts. I was getting ready to stretch out when ‘Art’ pulled up alongside me on his bike. Still be winded, I asked, “How’s….. it….. going. He told me that his mother had passed away two weeks ago at the age of 96. I noticed a tear gather in the corner of his eye and spill unchecked down his cheek. He then switched topics and asked me about prophecy being fulfilled. (Art is the same person that I’ve BLOGGED about previously) Before I could answer, he proposed that there have people waiting for these prophecies to be fulfilled, in every generation. He pointed to the Jehovah’s Witnesses that have predicted, wrongly, I may add, the end of the world, at least a half a dozen times. I told him that I was very familiar with this line of reasoning and I’m asked about this all the time. I then launched into a diatribe about how all prophecy, or at least what concerns us today, hinges around the gathering of Israel, from the four corners of the earth and the reestablishing of it, in it’s ancient homeland. Of course this is what happened in 1948. Israel became a nation, in a single day, as the United Nations voted to recognize the nascent state. What is even more incredible, is that several prophecies were then fulfilled in 1967 during the Six Day war. Israel regained the old city of Jerusalem, thereby fulfilling the prophecy that, Jerusalem would be trampled over by the gentiles, until the times of the gentiles were finished. The 67 war also fulfilled the prophecy of Psalm 83, that lists the same nations that fought against Israel in that war. All of this is set up the following. We are seeing the stage being set, as the nations that are listed in the Ezekiel 38 & 39 prophecy are now all in place. According to the DEBKA file, Iran is now closer, to creating a nuclear bomb, than previously thought. Added to this is the realization the United States just sold the Israeli’s 1,000 bunker busting bombs – I wonder what for? The Russians – MAGAOG in the Ezekiel prophecy – have also entered the fray, not only with their recent military engagement in Georgia, but by selling the Iranians an advanced antiaircraft defense system, the S-300. This is a surface to air missile that ups the anti, for any aircraft that might attempt a strike on Iran’s, nuclear program. Iran’s president, Mahmoud Ahmedinejad, has recently threatened that, “If anyone allows themselves to invade Iranian territory and its legal interests… our armed forces will break their hands before they pull the trigger…” (Iran is the 2nd nation listed in the Ezekiel propehcy) So the saber rattling continues and most folks don’t even know that when this breaks loose it will be far greater destruction than what the world witnessed at, Hiroshima, or Nagasaki. One morning we will wake up, turn on the news and to our horror we will learn that the Middle East has erupted in war. The prophecy was written for our behalf. It was not written to create fear, but to warn us of coming events. In my opinion, it points to a being that is outside our space time continuum that has written what will happen as, He knows the end from the beginning and the beginning from the end. As we watch these events unfold, we should not have a spirit of fear but of, power, love and sound mind.